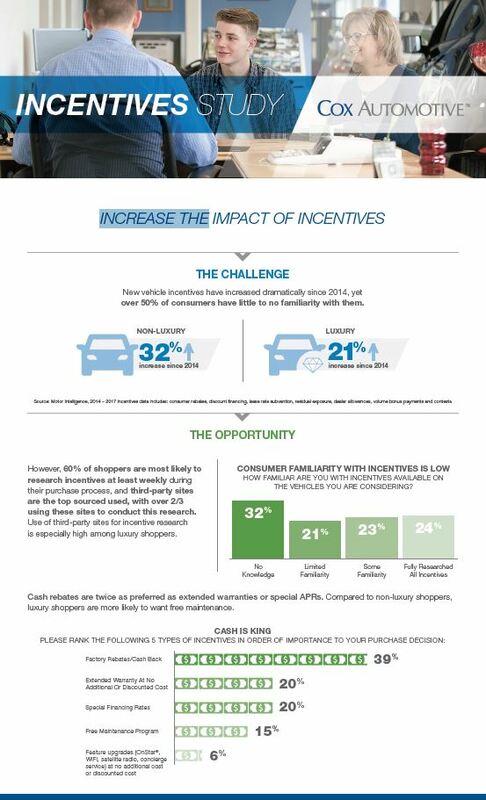 Cox Automotive Incentives Study - Cox Automotive Inc. Third-party sites are the top source used to research incentives, with over 2/3 using these sites to conduct this research. OEMs and Dealers need to ensure that they are merchandising their new vehicle inventory with prominent and consistent incentives across their online presence. Cash rebates are twice as preferred as extended warranties or special APRs. Compared to non-luxury shoppers, luxury shoppers are more likely to want free maintenance. Certain incentives and combinations of incentives are more motivating to consumers – especially within the week before these offers expire. Dealers can use tools, such as Cox Automotive Integrated Incentives, that automatically account for the latest factory offers to help eliminate the time-consuming complexity of managing incentives and rebates. New vehicle incentives have increased dramatically since 2014, yet over 50% of consumers have little to no familiarity with them. However, 60% of shoppers are most likely to research incentives at least weekly during their purchase process, and over two-thirds look for this information on third-party sites. This infographic shows the types of incentives that resonate best with consumers. It also provides ways that OEMs and dealers can turn the challenges around incentives into opportunities to influence more in-market shoppers. Download for tips on how to increase the impact of incentives.